Paint happy little trees, clouds, and more alongside Bob Ross. 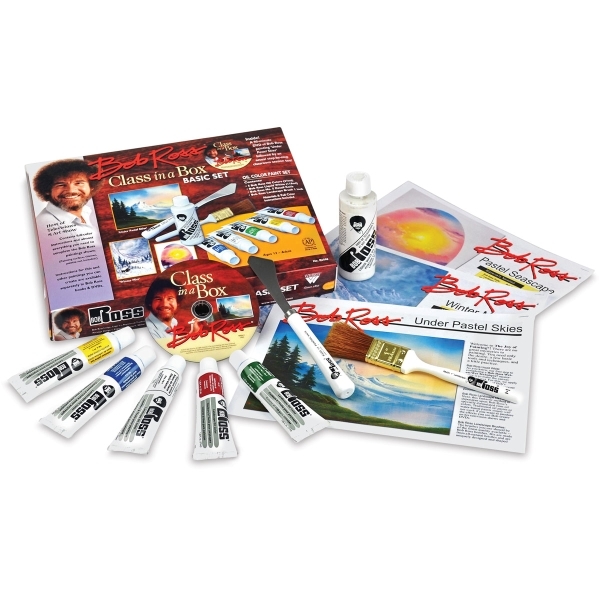 The Class in a Box Basic Set contains tools, materials, and instructions for creating three Bob Ross oil paintings — Under Pastel Skies , Winter Mist , and Pastel Seascape . A 90-minute DVD features Bob Ross painting Under Pastel Skies followed by a step-by-step classroom session led by a certified instructor. The projects are further outlined in the full-color written instructions. You'll learn to master Bob's signature wet-on-wet technique using Bob Ross Oils. The set provides all five colors needed to complete the featured landscapes — Alizarin Crimson, Cadmium Yellow Hue, Phthalo Blue, Sap Green, and Titanium White. Great for home, studio, or classroom use, the oil paints are non-toxic.